The Marcobrau Beer Pages are back online and updated, with more changes to follow. This blog will still be updated more frequently, but it's good to have the website I've had up since 1999 back online! The marcobrau domain should start forwarding back to the MBP in a matter of hours, if not sooner. Attention Marcobrau Beer Pages web surfers! Just a note to those seeking the Marcobrau Beer Pages. You may have noticed that the domain marcobrau.com now forwards to this blog. This is happening because I haven't been able to make changes to the Marcobrau Beer Pages website. Once I can get access to the site, I will likely bring it down and possibly move it to another host. 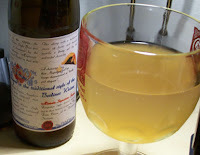 I've only been able to find one commercial Berliner Weiss-style beer in my area and that is 1809, brewed by Dr. Fritz Briem of the Doemens Institute (a brewing school in Germany). I bought the beer figuring I'd taste it and then maybe pitch the "dregs" into the secondary fermenter of my Berliner-style Weisse. Upon pouring this beer into a goblet (old Falstaff glass), I immediately caught a whiff of the same smell I remember from the sour mash of my homebrew. An almost sour milk-like aroma, yet sweeter and mixed with some light floral hops, and therefore not as offensive. The lactic sourness and fruity complexity of this beer actually reminds me of a beer from New Holland Brewing Co. a couple years ago called Pilgrim's Dole. If I could pinpoint the flavors, it would be a sort of pineapple fruitiness combined with the lactic sourness. This would indeed be a very quenching brew a warm day. The body is very light, the finish dry and tart, with very little hop character. A very refreshing brew that is definitely worth a try. I started something the other day that I haven't done before -- I started a sour mash. 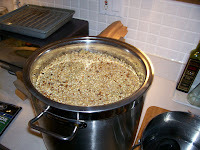 I put two pounds of milled Pilsner malt and a half ounce of Spalter hops with about three quarts of water in a stainless steel pot, heated it up to around 120 deg. F. and let it sit in oven for about 36 hours. It was good and stinky (like sour milk) when I uncovered the pot this morning, so I knew I had some lactic bacteria working. I took this mash and dumped it into a very large strainer that fits over my brewpot and sparged with about gallon or so of 175 deg. F. water, simply ladling the sparge water over the grain. I added four pounds of Alexander's Wheat LME and boiled the mixture for about 15 minutes (mostly to integrate the LME into solution), but also felt like I wanted to kill the bacteria before introducing cooling the wort and pitching a Wyeast Activator pouch of 1007 German Ale Ale. If you haven't already figured it out, I'm trying for something like a Berliner Weisse. I realize that a German brewery wouldn't have boiled the wort to let the lactic bacteria keep working, but I'm an American brewer and a homebrewer at that, so I'll do what I want. Anyhow, I miss being able to get Berliner Kindl, but I'm predicting that the lactic (sour) mash of the two pounds of pilsner malt won't add that much sourness to the beer, so I've purchased a bottle of some 88 percent lactic acid solution that I figure I can dose the beer with at bottling time if necessary. Who knows maybe I'll omit the lactic acid and have myself more of a Berliner Weisse crossed with a Kentucky Common beer? I started a website about my love of beer almost 10 years ago. The site is called the Marcobrau Beer Pages. I don't update the site nearly as frequently as I used to; lately I seem to prefer posting stuff to this blog. I don't know if it's just easier (no coding of HTML) or just more fun, but that's what's been happening. Now it seems the index page is corrupted and I can't connect to the site via FTP to fix it. The connection just times out. It's frustrating, but I guess it's what I get for having the site on AT&T Worldnet. I've sent an email to AT&T and I'm awaiting a response. I love Rogue beer, but I usually drink it on tap. I drink Rogue on tap mostly because those $5 bombers and $10 six-packs drain my funds pretty quickly. The good news is that I'm a homebrewer and most of the ingredients available to Rogue, are also available to me. So far, I've just attempted knock-offs of some of the simpler Rogue beers, such as the Dry Hopped Red, but yesterday I bottled (and pigged) a batch of amber ale inspired by Rogue American Amber. The packaging went well; there were no problems except for over-pressurizing the pig (it started to leak a bit before I bled the excess air out of it). The beer tasted pretty darn good with quite a bit of caramel sweetness up front and a bold smack of hops in the finish. There was just a touch of roasted malt complexity, too. Unfortunately, this particular Rogue-ish brew is a pretty loose interpretation. I've had success before in finding all the ingredients for a clone of the St. Rogue Red, but this time I had to improvise a bit. I constructed this amber ale using six pounds of pale liquid malt extract from Northern Brewer, along with a pound or so of Munton's DME. The grain included some steeped crystal malts; British 150L and 70-80L Crystal. The hops included Amarillo and Simcoe pellets which were substituted for the Kent Goldings and Cascades used in Rogue American Amber; mostly because I have almost a pound of Amarillo pellets in my freezer. The Amarillo hops were used mostly for bitterness with the Simcoe added later in the boil. Everything was fermented with Wyeast Northwest Ale (which believe is from Hale's, NOT Rogue. I also got a little nuts and added a half-ounce Warrior hop plug in the Party Pig. I expect a lot of hop aroma out of that pig! I had planned to re-pitch the yeast from this batch into an American-style barleywine along the lines of Rogue's Old Crustacean, but now I'm leaning more towards my first partial mash attempt at a Berliner Weisse. In my continuing quest for quality American lager beer, I have been given a bottle of Summit Grand. I've had this beer before, but it's been awhile and I couldn't find any notes, so here goes. The brothers at Beer Advocate have classified Summit Grand as an American All-Malt Lager and I would agree that this is probably the best description of this beer. The beer pours gold with good amount of carbonation that builds a pretty decent (one-finger) head of foam. The head falls fairly quickly to miniscule collar. The nose on this beer is pretty decent somewhat floral with hops, but also malty. The malt flavor is crisp with some toasted malt highlights. Overall, the flavor almost borders on being sweet, but the finish is crisp and just dry enough to enhance drinkability. I seems to also seem to be picking a very slight sweet-sour tang in the finish; almost a kind of mineral-like "zip" to the beer. This is definitely a good golden lager for colder weather; I think this beer could come across a touch cloying or at least too sweet in the heat of summer.